SYB Optimist Club of Lusby, Lusby, Md. The SYB Optimist Club of Lusby (SYB) seeks to make the sports experience safe, fun and healthy for ALL children. In addition, SYB promotes the value and importance of sports and physical activities in the emotional, physical, social and mental development of youth. We believe that participation in sports and activities develops important character traits and lifelong values. In addition, we believe that the lives of our youth can be positively influenced by participation in sports and physical activities, if the adults apply their training and information. 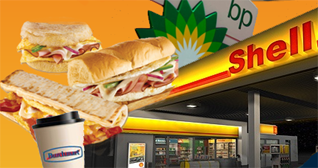 Quality gas and good food at your convenience. Several locations to serve you throughout So. Md. !